Where did this scarf and hood start? I wanted a hood and scarf that even a newcomer to crochet could make and was inspired by this beautiful but, simple, crochet lace stitch pattern. By adding some seaming to make a hood, a beautiful, unique accessory is created that even a beginner can make! The scarf and hood is worked flat as a rectangle, then seamed to create the hood. It uses chain stitch and double crochet to make the crochet lace. The lace pattern is both written and charted. It is written for one size, but is easily adjustable to the amount of yarn you have. 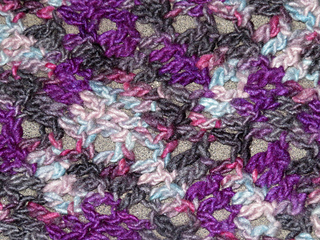 The sample was made using Single Silky Targhee from Blue Moon Fiber Arts, which is 70% Targhee wool and 30% tussah silk. If you are substituting yarn, any DK or Light Worsted single yarn with 50% or more wool will work up just as well. The pattern is written using US terminology. It has written instructions, and the stitch pattern is both written and charted. Please note that gauge is not specifically important to this pattern, though changes in gauge will affect the amount of yarn used and the size of the final project. If you want to teach a class using this free pattern, go ahead. If you liked this free pattern and would like to try another pattern from Sarah Dawn’s Designs for free, you can sign up for the Sarah Dawn’s Designs E-mail Newsletter and a Free Pattern Download here.